Apple has just posted a new Christmas-spirited Get a Mac commercial on their hompage, just in time for the holidays. Check it out in the Videos section or subscribe in iTunes to our Daily iLife Podcast for a daily Mac video. Happy holidays!! 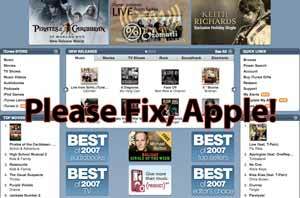 Since its induction on April 28th, 2003, the iTunes Store has been the internet’s most popular digital content source (that is, legal source). Yearly selling over 3 billion songs, not to mention millions of television shows, music videos, and movies, the iTunes Store easily holds the lion’s share of the market and has set the standard for digital media stores today. Today, my brother showed me the back of Sports Illustrated, and there was a cool iPod Touch Advertisement.